This chapter presents research about a combination of physical experimentation (PE) and virtual experimentation (VE) in computer-based inquiry learning as an instructional value to students' affective domain. For this study, the author has developed a science lesson for promoting interactive inquiry learning, and the researcher investigated whether orchestrating PE and VE in sequential learning affect students' learning perception and science motivation. To evaluate the lesson, questionnaires were used to examine how students perceived the lesson and their perceptions about how the lesson promotes science motivation. The results indicated students' positive perceptions that experiencing the lesson supported cognitive performance, emotional practice, and the social inquiry process. In addition, exposure to the lesson improved students' science motivation for both females and males. This highlights that the combination is an effective way to enhance the effectiveness of high school science learning. 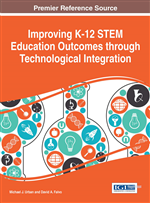 Based upon the recent demand for human resources in science, technology, engineering, and mathematics (STEM), there is a need for the development of high-quality programs for STEM teaching and learning in K through 12 environments. Many students need more robust STEM education to survive with accelerating changes in the 21st century society (Sanders, 2009; State Educational Directors Association, 2008). To create effective classroom environments for STEM teaching and learning, there is a requirement for comprehensive integration of technology as a fundamental building block into education in the following areas: (a) to develop proficiency in 21st century skills for students; (b) to support innovative teaching and learning; and (c) to create the robust education support system for both students and teachers (State Educational Technology Directors Association, 2008). Technology has profound and lasting impacts in school classrooms as being a powerful instructional tool. It can transform the way core subjects are taught by facilitating both teachers' instructional practices and students' learning processes (Edelson, 2001; Jimoyiannis & Komis, 2007). STEM educators value the use of technology to support STEM instruction. They believe that several technologies including probeware, computer simulations, software applications, programmable instruments, mobile devices, and laptop/notebook computers could be used effectively to impact student learning in STEM subjects. To meet the challenges in teaching STEM subjects, the use of computer-based laboratories and features make it possible to envision dramatic changes in instructional environments and create unique STEM learning environments in particular support of STEM teaching strategies and active learning. It is widely known that teaching science by way of memorizing scientific facts, describing what science is, and showing students how to do science does not work for motivating students into meaningful learning of the sciences and in developing a comprehensive understanding about science (Srisawasdi, Moonsara, & Panjaburee, 2013). The traditional, highly structured laboratories, which provide questions, theories, and experimental and analytical procedures of inquiry, produce a robotic style of thinking, and are not sufficient for developing mind-on learning about science and science literacy (Zion, 2006; Zion & Sadeh, 2007; Srisawasdi, 2012a). The traditional lab situation may prevent learners from obtaining valuable scientific experiences from the inquiry process, and in reality, may result in students’ lack of understanding because of an inability to transfer what they learned (Srisawasdi, Kerdcharoen, & Suits, 2008; Srisawasdi, 2012a). Moreover, they cannot feel the ownership of learning because of their passive role in traditional science classrooms. The crucial idea, in promoting the students’ involvement in active learning and the potential of scientific inquiry, was the use of technology to support their inquiry experience. Due to reform efforts in the science education community, computer-based laboratory environments are widely used in inquiry-based activities motivating and enabling students to experience science. In addition, they have been used to improve scientific inquiry activities by providing instructional affordances for more flexible inquiry-based learning experiences and by incorporating more features of authenticity in science (Buck, Bretz, & Towns, 2008; Chinn & Molhotra, 2002; Chinn & Hmelo-Silver, 2002; Srisawasdi, 2012b).